Sunday the British military in Iraq transferred security authority over Basra to the Iraqi Army. Although the transfer took place in an orderly fashion, the British leave behind one of the worst security nightmares in that troubled land. As one senior Iraqi military officer told ABC News, "The British legacy in Basra is criminal gangs, a corrupt and infiltrated police force, and borders open to all." During a visit to Basra on December 9, British Prime Minister Gordon Brown hailed the British training of Iraqi police and security services as one of the greatest accomplishments of the British mission in the province. Iraqi military commanders who are now charged with asserting control over these British trained forces are less sanguine. As one senior commander told ABC, "Out of 17,000 policemen in Basra, some 14,000 are beholden to militias and some to the Iranian secret service." The commander added that the British training of an estimated 10,000 policemen in southern Iraq has done little to alter their loyalties. Post-British Basra is a frightening place. Some 40 women have been brutally murdered over the past year for failing to wear burkas. The city's Christian minority is being targeted for annihilation. Last week, terrorists in police uniform stormed the house of a Christian family, and abducted and brutally murdered a brother and sister. In response to the attack, the Christian community cancelled all Christmas festivities. During their disastrous stewardship of the city, the British ignored the primary lesson of al-Qaida's development in post-Soviet withdrawal Afghanistan. The main lesson of al-Qaida's rise from the remnants of the US-supported mujahadeen who fought the Soviets in that country throughout the 1980s is that the enemy of your enemy is not necessarily your friend. By training and arming the mujahadeen in the 1980s, the US may have fomented the defeat of the Red Army, but it also enabled the mujahadeen to gain a victory over a superpower which they used as a basis for building an international terrorist movement that defines the US and the rest of the West as their new targets for destruction. ACTUALLY, in their mishandling of Basra, the British did not merely ignore the lessons of Afghanistan's al-Qaida blowback, they took that American strategic failure to understand that the mujahadeen were their enemies a step further. While the Americans and the Afghan jihadists did have a common foe in the Soviet Union, the British actually had no enemy in common with the Iranian-backed jihadists they trained in Basra. The only thing the Iraqi jihadists they trained had to recommend them was the fact that they are Iraqis. By training them, the British pretended that they were advancing the cause of Iraqi independence when in fact they were working to ensure that Iraq will have a difficult time emerging from their stewardship as a coherent, peaceful multiethnic state. BRITAIN'S foolish and dangerous actions in Basra are strikingly similar to the international community's policies regarding the Palestinian Authority generally and the PA's security services specifically. And whereas in Iraq there is some chance that the wreck the British have made of Basra can be fixed by the Iraqi military and the US forces in the country, there is no countervailing force to curb the adverse impacts of the international community's treatment of the corrupt, terror supporting, jihadist Palestinian security forces. This is the case because the Israeli government, which is the only countervailing force that could repair the damage, is exacerbating the problem. Since the PA and its security forces were formed in 1994, they have never once taken serious action against the terror infrastructure in either Judea and Samaria or Gaza. Indeed, the PA and its security services played a central role in building those infrastructures of terror. Beyond that, since 1996, every single time that the PA's security services have been forced to choose between Israel and the terrorists, they have joined ranks with the terrorists to attack Israel. In spite of this fact, yesterday representatives of 90 states and organizations convened in Paris and pledged to give the PA $7.4 billion over the next three years. The PA will receive some $1.7 billion next year – $1.2 billion of which will go to funding the PA budget. Most of that money will be spent paying the salaries, arming and training the PA security forces. As the Jerusalem Post's Khaled Abu Toameh reported last Friday, the commanders of those forces openly acknowledge that in spite of the hundreds of millions of dollars they have already received from the US and the Europeans since the Hamas electoral victory two years ago, and notwithstanding the training and arms they have received from the US, the Europeans and the Russians, the PA's security forces have yet to take the first step towards reforming themselves or combating Hamas, Islamic Jihad and Fatah's own Aksa Martyrs Brigades. They continue to be run by corrupt and criminal commanders. They have failed to abide by their pledge to cut the size of their forces from 70,000 to 35,000. Indeed, despite US prodding and Israel's willingness to allow these forces to deploy in the Palestinian cities and villages of Judea and Samaria, PA forces have taken no action against any terror cells anywhere. As one Palestinian official summed up their operations, "We arrested citizens who stole olive oil three years ago or fired into the air during weddings two years ago." Of course, PA forces have done more than arrest olive oil thieves. They have also attacked Israeli targets. For instance, last month Palestinian policemen murdered Ido Zoldan. Last summer other US-trained policemen plotted to assassinate Prime Minister Ehud Olmert. A WEEK before Zoldan was murdered by US-funded PA security forces, Olmert approved the shipment of two million bullets for AK-47 assault rifles and 50 advanced Russian armored personnel carriers to those forces in Judea and Samaria. The delivery of the APCs has been delayed because the Palestinians insist that they be deployed with roof mounted machine guns and Israel has refused to accept that demand so far. In the meantime however, the bullets have apparently arrived safe and sound. In spite of the Olmert government's insistent support for the PA forces, neither the general public nor IDF forces accept their delusions. Immediately after the government decided to approve the shipments, a battalion of reservists from the Alexandroni infantry brigade sent a letter of protest to Olmert. In their letter, signed by the battalion's commanders and 50 soldiers the reservists wrote, "We turn to you at the last minute and call on you to stop the convoy of APCs and the shipments of ammunition to the Palestinians. We have no doubt that the ammunition and the APCs will be used against us, against our comrades and against Israeli civilians just as the arms transferred to the Palestinians in the Oslo process were. It isn't enough that in recent days the government approved the release of hundreds of terrorists from prison. Today you are arming them." Discussing the letter with Ma'ariv, the battalion commander noted, "The only one making the distinction between Hamas and the Palestinian Authority is Israel. They don't make the distinction and so it is obvious that these weapons will fall into the wrong hands. It is clear to me that one day I will fight against the weapons that my country gave them." bucking up terrorists is clear enough: they want to pretend they are advancing peace and Palestinian statehood. But what explains the Olmert government's behavior? Why did Foreign Minister Tzipi Livni tell the audience at Monday's donors' conference that Israel will enable the Europeans to provide advanced military training to the PA militias? A strong indication of the logic that stands behind the Olmert government's support for the PA security services is found in the policy it is simultaneously enacting towards the self-defense units which provide security for the Israeli communities in Judea and Samaria. Over the past two months, while arming the PA security forces, the government has been instructing the IDF to place new draconian limitations on the ability of the Israeli communities to protect themselves from attack. In two weeks, the Defense Ministry will disband the civilian units comprised of residents of the most threatened Israeli communities. Since they were established two years ago, these units have borne the brunt of responsibility for defending their communities. Next month too, new regulations will make it more difficult for Israelis to receive weapons permits to participate in guard duty in their communities. 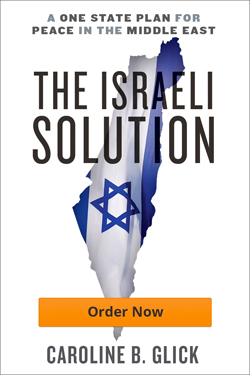 In taking these steps, Olmert and his colleagues demonstrate the perverse lessons they learned from the withdrawal from Gaza. During the period leading up to the withdrawal, the Sharon government scaled back IDF counter-terror operations. They also curtailed the ability of the Israeli residents of Gaza to defend themselves. In so doing, the Sharon government both enabled an increase in terror and successfully portrayed the Israeli residents – shorn of their defensive capabilities – as a security burden. These twin policies secured the support of Israel's governing leftist elites in the media for Sharon and his colleagues. In repeating the Sharon government's policies towards the Palestinians and the Israeli residents of Judea and Samaria, the Olmert government is similarly receiving the backing of the media. As the current situation in Gaza shows, although the Olmert government's policies may strengthen it politically, its consequences for Israel's national security will be devastating. If Basra's current security morass is Afghanistan squared, the consequences of Israel's irresponsible actions in Judea and Samaria will make Gaza – and Basra – look like a walk in the park. It appears that the Olmert Government is planning to donate Judea and Samaria to the PLO. It is a non sequitur to follow the Gaza withdrawal model because it was a total failure. Israel is paying heavily for giving up Gaza, and it will pay the piper, if it surrenders Judea and Samaria. The leaders of Israel, it seems to me, like their counter parts in India have long forgotten their mistakes of the past. Like India with Pakistan, Israel is yet again making a foul attempt of reconciling with Palestinians at the cost of their National Security. What’s the matter with them? Can’t the realize the lives that they are putting at risk by arming and supporting the Palestinian fanatic militia? God save Israel and Israelis! I have no doubt Olmert and the branja want a repeat of the Gaza Disengagement. They are just looking for the right spin doctors to convince the Israeli public that Israel will be safer shorn of its historic heartland. The branja perversely believe that the function of their strength is getting rid of those who would vote for their opponents. The weaker their opponents are, the stronger they are. That it would leave Israel more vulnerable to future enemy attack is outside their purview.